Although it may seem counter-intuitive to discuss the crime novel in the context of superhero stories, this impression is deceiving. Once we attend to the several registers on which it operates, the superhero figure turns out to be a complimentary designation. The archetype’s story carries a universal message that is consistent with the defining features of the crime fiction hero. In the simplest possible reading, the detective and superhero are both clasped in a struggle with evil while they themselves represent good. Yet the attributes they share do not stop here, as I will try to demonstrate later on in this article. The crime novel detective operates within literary space, which is to say, in the domain of the word. The superhero, meanwhile, is associated with comic books and therefore linked to images. The action that unfolds in the crime novel as one sentence follows another plays out in comics through images. Plot develops through sequential events: in the novel, images are generated by the imagination, and in comics, the visual sphere is supplemented with words. In both cases, the usage of hyperbole, understatement and literality turn out to be of utmost importance. In the crime novel, hyperbole seems to be particularly out of place. What we colloquially call “exaggeration” usually affects the quality of a literary text and taints our assessment of the author’s talents. In comics, it is just as important to avoid abusing language. In this case, speech is usually packaged in the unit of the short dialogue. When the characters’ statements run on too long, the reader suspects they are meant to compensate for a weak illustrator who relies on dialogue to gloss over his patchy skill set. In comics, we are most affected by what we see and not what we read. We can say the opposite of the crime novel: the written text allows us to visualize all that the author describes. Understatements are instrumental for building tension in the crime novel. Comics are also based on a form of fine-tuning that stems from a lack of literality. Illustrations allow us to multiply meaning and do not restrict potential readings to a predetermined template. Genre literature relies on narrative schemas for character construction. It is no different in the case of the superhero comic. The recipe for success – with both readers and publishers – often proves to be the law of the golden mean: stay faithful to genre conventions, but simultaneously prove you are willing to renegotiate them. The suggestion voiced in the article’s title to affiliate the crime novel with the superhero story would involve eliminating differences derived from different methods of visualization. It would also require defending the claim that the detective is the trademark of the crime novel, and that the superhero has an analogical function for comics. In Bloody Hundred (Krwawa setka), Wojciech Burszta and Mariusz Czubaj dispel all illusions: “Another feature of the good crime novel – and this can likely be said of no other literary subgenre – is the fact that its heroes are memorable. Indeed, we might even go so far as to say that the good crime novel that lacks distinctive characters does not exist.” In this sense, we should remember that both the crime novel and comic have the potential to broaden their reception through potential film adaptations. In both cases, mass marketing becomes critical: established fans will be curious to see what the filmmakers come up with, and for those yet to be converted, the popularity of a particular fictional character is a good enough impetus to head to the theater or settle down in front of the laptop or television to watch the film or show. Finally, even those who are not persuaded to watch will still have some rapport with the figure, for the marketing machine is so powerful that some of the information targeting potential viewers will trickle down to them as well. As a result, popular culture’s ability to amplify content stages an encounter at the intersection of genres based on a shared idea governing the heroes’ deeds, a consensus on how to represent the world, and finally, a message transmitted through the narrative that evil can (at least for now) be overcome. One pertinent example of complementary activities tied to the comic and crime novel that also reveals a literal tie between the two genres is the James Bond series. This franchise includes novels, a series of films bringing even more fame to the hero and the man who conceived him (Ian Fleming), a comic book series, and an ever-expanding product line of Agent 007 gadgets. All these things not only demonstrate an existing union in terms of Bond’s usefulness as fodder for diverse genres and marketing activities, for they also allow us to discern a specific form of character construction based on a dual affiliation with the crime novel and superhero. This double identity, which enables a broad and rather complex form of identification, has been instrumental for Bond’s popularity. The guarantee of repetition promised by the episodic story structure offers a stable point of reference for an audience that has grown accustomed to the chronic obsolescence of content that is endemic to popular culture. Yet this particular hero archetype represents a fashion that will never fade but will reach future generations of viewers, becoming a fundamental part of the canon and therefore of tradition. As a special agent whose deeds are legitimated by a license to kill, James Bond operates according to the parameters of the crime genre or sensation novel. He is always solving a crime, and in this sense, he embodies the genre attributes of the detective, who is always asking questions, searching for clues, and finding himself in places where he doesn’t belong. At the same time, he actively reacts to reality and takes advantage of his extraordinary skills to defend the world from evil. These skills seem to qualify him as superhero. To combat his nemeses, Bond also relies on his intelligence and the latest inventions of cutting-edge technology. In this sense, his actions justify linking him to comics and the superhero archetype. Both heroines evoked here come from a difficult past fraught with traumatic childhood experiences and the experience of rejection. What seems settled in the past resurfaces in adult life to demand retribution. The heroines must take matters into their own hands. They cannot allow the past to be forgotten and go to great lengths to finally settle their accounts. In the struggle between good and evil, time is merely the criminal’s false ally. Victims do not succumb to the power of passing time, for they gain agency and actively demand we revisit the deeds of those they hold in contempt. This position links the crime novel investigator to the comic book superhero. By observing the private lives of female and male detectives, we can come to the conclusion that engaging in the war against evil necessarily has a negative impact on one’s close relationships and capacity to enjoy daily life in a state of domestic bliss. For women, this scenario tends to be fraught with severe conflict. Their devotion to their work precludes their ability to actively embody stereotypical roles as mother or wife. As a result, they are often driven to leave their partners or restrict their relationships with their children. The life complications that arise for men look no different. Due to their vocation, they too are scarcely at home and cannot be relied on, for they prioritize work over family, often fall prey to addictions of various kinds, and are besieged with constant health problems. In this way, the attempt to save the world from evil seems to coincide with the failure to save oneself from solitude, abandonment, and the stigmatized role of one who fails his loved ones in trying moments. All these entanglements also constitute the basic parameters of crime fiction. For a nuanced and pertinent portrayal of these complications, we might turn to the travails of police officer Kurt Wallander from Henning Mankell’s crime series, or the adventures of the journalist Annika Bengtzon, whose tales are brought to us by Liza Marklund. At the end of the day, these figures are rather ordinary, but the moment they choose to rise up against evil, they become superheroes. In a literal sense, they may gain no superhuman skills, but metaphorically, we might say they experience the same process that allows Superman, Batman and Iron Man to come to the rescue of society as a whole (or its metonym). The repetition of the transformation motif seems meaningful, particularly since it is embedded in the fight between good and evil. It seems reasonable to claim that engaging in the war with the dark side of existence comes hand in hand with the need to don a mask or costume that endows its wearer with symbolic strength. This potential to undergo the same dilemmas and feelings that preoccupy the superhero suggests that detectives tend to operate in isolation and are thereby condemned to live in a perpetual state of suspense. The continuity and relentlessness of the mental process of investigation boxes one out of daily reality as defined by the typical routines of family life. As a result, female and male detectives, just like superheroes, must regularly face situations that restrict their ability to feel integrated in the group with which they identify. They forego privacy in their work. When they try to nurture their relationships with their loved ones, they perpetuate a fraud: they are incapable of fully entering into the role of father or partner, for their minds constantly drift back to their vocational duties. Burszta and Czubaj’s argument casts the protagonist in a different light by drawing out its negative features, and also offers a compelling pretext for determining to what extent the superhero and antihero are actually that different. As it turns out, it seems entirely viable to interpret both patterns of behavior positively (or at least sympathetically) and critically. Depending on how we judge these characters, we can classify them as antiheros or superheroes. They are both fundamentally isolated – this much is certain. It also seems that their engagement in ethical struggle fails to qualify as a differentiating feature. Even the superhero finds himself in situations that require him to choose “the lesser evil.” What is more prominent in the superhero, however, is his conscious ethical accountability for all that he does, even under coercion. This particular statement seems less applicable to the antihero. Although he manages to save the world, as a social companion, the superhero leaves much to be desired. If we peer into his daily life and note the constant pressure he is under to conceal a major part of himself, we might say that deceit is a non-negotiable piece of the identity of anyone who transforms (literally or symbolically) in order to fulfill her duty to society. It becomes difficult, then, to defend the claim that the superhero and antihero both reckon with the same moral relativism. What stands out here are the ramifications of bad decisions and the rejection of a certain ethical order in one’s private life at the service of the common good and the safety of the collective. We should also consider the ordinary life of the hero. This normal reality becomes a marker of the hero, but as he fulfills his social role and wages his solitary war against evil, this reality transforms. It becomes a constituent part of the environment that revives and reveals the superhero, and later on lulls him back to sleep. If we examine the crime novel detective in terms of her resemblance to the superhero, this by no means implies we mean to glorify the archetype. It would be more fitting to interpret this gesture in the context of a mutual dialogue between different cultural texts and the fluid circulation of archetypal schemas and behavioral patterns in popular culture. The superhero’s exceptional abilities might have some counterpart in the case of crime fiction heroes, with the exception of the fact that these figures are embedded in everyday reality and are not marked by recognizable attire. Their willingness to save the world from evil turns out to be a binding mechanism by which an ideological social order is restored to its dominant position. This levels out the differences in the methods for constructing these two archetypes and allows us to see their inbuilt complimentary qualities. On a cultural level, the superhero figure embodies the fantasy there will always be some noble opponent to counter evildoers. The detective, throwing off the mask and/or disguise that are the identifying markers of the superhero, finds himself firmly rooted on the same side of the barricade as his comic book counterpart. To speak informally, they play for the same team, although they may reach for separate metaphorical coats of armor when they set off for the next battle, thus betraying a divergence of tastes. The detective chooses camouflage and hides in the shadows in the early stages of investigation. The superhero, meanwhile, reveals himself as soon as he intervenes, for his costume creates him. In the lives of both detective and superhero, it becomes crucial to be able to accurately recognize when it is strategic to take cover under the ordinary, and when it becomes necessary to show one’s face, which is inevitably marked by the unordinary. Yet regardless of the potential to postulate some visual identity marker that binds them, their common goal compels us to examine both figures in light of their resemblance rather than differences. 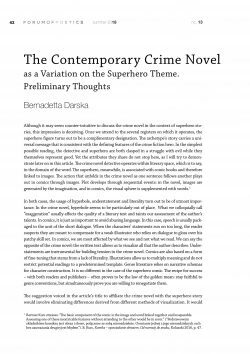 In the article “The Contemporary Crime Novel as a Variation on the Superhero Theme. Preliminary Thoughts,” I draw attention to the detective as the key figure of stories narrating the fight against evil. The detective’s behavior, decisions, and mentality all make him a figure quite compatible with the comic book superhero. I attempt to lay out features common to the detective and superhero, placing emphasis on the symbolism of the mask and disguise donned either metaphorically or literally in the confrontation with evildoers. I also discuss the complex nature of ordinariness and weakness as defining features of the contemporary detective, for they allow us to view the crime novel hero as an antihero, a figure that simultaneously (and somewhat paradoxically) is embodied in the role of the superhero. Bartosz Kurc stresses: “The basic component of the comic is the image and word linked together and inseparable. Assessing one of these inextricable features without attending to the other would be in error.” (“Podstawowym składnikiem komiksu jest obraz i słowo, połączone ze sobą nierozdzielnie. Ocenianie jednej z jego nierozdzielnych cech bez zauważania drugiej jest błędem”). B. Kurc, Komiks – opowiadanie obrazem. Od narracji do znaku, Koluszki 2016, p. 47. W.J. Burszta, M. Czubaj, Krwawa setka. 100 najważniejszych powieści kryminalnych, Warsaw 2007, p. 16. Writing on the superhero movie as a film genre and the movie Superman in particular, Bartłomiej Paszylk argues: “The effect was electrifying: fans of the Superman comics could not believe what they saw with their own eyes, for it was exactly as they’d imagined. And even filmgoers who had no interest in comics were quick to admit they had never before seen such exhilarating, entertaining cinema.” (“Efekt był piorunujący: wielbiciele komiksów o Supermanie nie mogli uwierzyć, że oto wyrósł przez ich oczami – i to właśnie taki, jakiego sobie wyobrażali. Z kolei wielbiciele kina niezainteresowani komiksami przyznali zgodnie, że z tak ekscytującym kinem rozrywkowym nie mieli dotąd do czynienia”). B. Paszylk, Superhero movie, in: ibid, Słownik gatunków i zjawisk filmowych, Warsaw-Bielsko-Biała 2010, p. 246. Tomasz Żaglewski has made interesting remarks on the expanding field of meaning for comics through various kinds of marketing activities tied to movie promotion. See: T. Żaglewski, Kinowe uniwersum superbohaterów. Analiza współczesnego filmu komiksowego, Warsaw 2017. See also: Nöell Carroll does not deny that repetition is a crucial element for defining popular culture: “A taste for easily accessible art will not evaporate soon, nor will the pleasure to be had from sharing artworks with large numbers of our fellow citizens. For people like to have commerce with the same artworks as their neighbours – far and wide – do. It is part of what Kant called the sociability of art. We enjoy reading, seeing, and listening to the same things, and then talking about them. We enjoy working references and allusions to them into our conversations. That our lovers and co-workers grew up with the same songs and the same TV shows we did is significant to us. It is an important element of possessing a common culture.” N. Carroll, A Philosophy of Mass Art, Oxford University Press, New York, 1998, p. 13. In this case, repetition is not only embedded in the schema of the protagonist’s experiences, but in the very construction of the figure we might describe as the superhero. See: M. Grzesiek, James Bond. Szpieg, którego kochamy. Kulisy najdłuższego serialu w dziejach kina, Warsaw 2011. Cited in: D. Jakobsen, Lisbeth Salander alias Pippi Longstocking, trans. by the author, “DJ’s Krimiblog,” http://djskrimiblog.blogspot.com/2009/01/lisbeth-salander-alias-pippi-langstrmpe.html (last accessed: 06.17.2018). I. Lind, Tajemny klucz do Millenium skandalisty Stiega Larssona, trans. K. Jachimska-Małkiewicz, Gliwice 2010, p. 126. 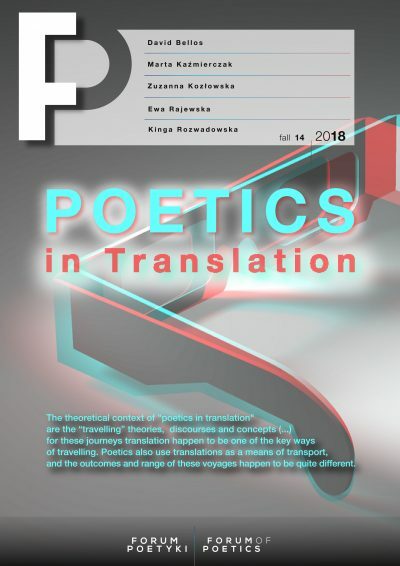 B. Limanowska, Mężczyzna, który pisał feministyczne kryminały, “Pogranicza” 2009, issue 6, pp. 94-95. W.J. Burszta, M. Czubaj, Krwawa setka, op. cit., p. 17.